On the Rocks – Exclusive limited 2nd revised edition now available! Some people are inspired by the remains of a once beautiful ship slowly decaying on a remote beach, for others however, it’s just an eyesore – a heap of rust spoiling its natural surroundings. 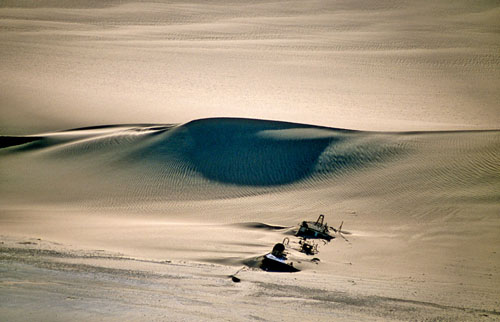 Dutch photographer Anton Rijsdijk obviously belongs to the first category. His interest in shipwrecks started when he was living in Aden, Yemen, close to a port with a large number of abandoned ships. That was in 1984. Today, more than three decades later, he is still hunting shipwrecks all over the world because of their interesting history and their inherent beauty – uniquely crafted by elements of nature. Most especially, his passion for adventurous travelling in search of wrecks keeps him going. Often the trip to a wreck site is as interesting as the wreck itself, according to the Dutch photographer. 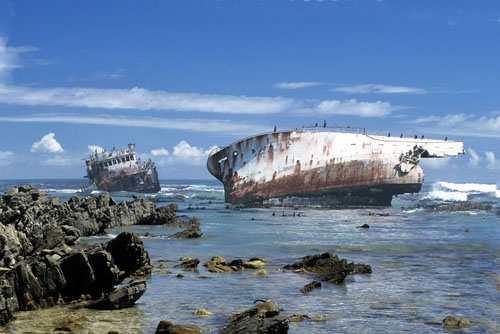 Shipwrecks can be found on remote beaches, on coral reefs in the middle of the ocean, at restricted diamond mining areas and other faraway places. Some shipwrecks are silent witnesses of war casualties like the Japanese shipwrecks in Indonesian waters, others are victims of severe weather or navigational errors. Some ships were abandoned on the beach or in the port, others found their final destination as scrap on ship breaking yards like Alang Beach in India, the world’s largest ship graveyard. 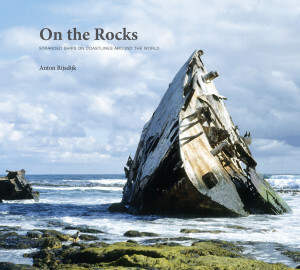 Rijsdijk has succeeded in capturing the essence and beauty of all kinds of visible shipwrecks on coasts worldwide and has brought together the most picturesque shipwrecks in this unique and most colourful photo book. Illustrated with breathtaking and inspiring photographs, this book details the GPS position, charts and maps and information on over 60 wrecks that can be found worldwide. The photos paint a unique bitter-sweet picture of intriguing shipwrecks. Featuring previously unpublished images from Rijsdijk’s private archive, this book is dedicated to the beauty of stranded ships and is a summation of Rijsdijk’s many years of wreck-hunting that have made him a prominent authority on above the waterline shipwrecks. For more artistic photographs of intriguing shipwrecks captured by Rijsdijk, please visit his website at www.visible-shipwrecks.nl.